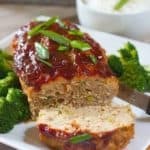 If you love potstickers, you are going to love this version of Asian Chicken Meatloaf! Preheat oven to 400 degrees. Spray a 8 x 4 inch loaf pan with non stick spray. Combine all meatloaf ingredients in a large bowl. (excluding glaze ingredients). Your hands are your best tools for this! Add to prepared loaf pan. Combine your glaze ingredients in a small bowl Pour over uncooked meatloaf and spread evenly. Bake at 400 degrees for about 50 minutes or until internal temperature reaches 165 degrees. Serve with white rice and steamed broccoli if desired! We prefer to use ground chicken or turkey 93/7 or 95/5 fat content. The all white ground chicken or turkey is a bit dry. Serve with a simple side of steamed veggies like broccoli or these delicious Honey Glazed Carrots!